The only donor listed at the highest level was "Citizens of the United States of America," a reference to the $66 million in taxpayer money the commission has received since its inception in 1999. The Taiwanese government has said it is donating to the memorial to honor Eisenhower’s "staunch support for Taiwan’s security" during his presidency, which coincided with the signing of the Mutual Defense Treaty between the United States and Taiwan. The island country has donated to other memorial projects in the past, including $1 million for the Pentagon 9/11 memorial in 2005. That year, the commission began paying the firm Odell, Simms, & Lynch to pursue an aggressive fundraising campaign. While another firm had advised the commission to set "an achievable" fundraising goal of $10-$15 million—cautioning that potential donors felt "the price tag was much too high for the memorial, and there is concern that the architect chosen will result in even higher costs"—the commission hired Odell, Simms, & Lynch to raise $30-35 million by 2015. Last year it announced a list of celebrities who would help raise funds for the memorial, including newsman Tom Brokaw and actor Tom Hanks, whose televised appeal on behalf of the World War II memorial led to a massive fundraising haul. The commission also announced that World War II hero and former Senate Majority Leader Bob Dole, who oversaw fundraising for the World War II memorial, would spearhead its fundraising effort. The five-year fundraising campaign is now "fully underway," the commission reported to Congress last year. "Americans are simply not opening their wallets to what is essentially a monument to architect Frank Gehry's ego instead of a memorial to Ike," said Bruce Cole, a leading critic of Gehry’s design who is a member of the Eisenhower Memorial Commission. The memorial design features a monument core with three statues of Eisenhower depicted as president, Supreme Allied Commander, and a lanky Kansas farmboy. The memorial’s backdrop is a series of 80-foot columns suspending a woven stainless steel "tapestry" of a Kansas landscape. "It is inconceivable that the Eisenhower Commission will raise enough private funds to complete the memorial. Anyone who thinks otherwise is in la la land," said Justin Shubow, president of the National Civic Art Society. The financial hurdle would be even higher due to a law that requires memorial sponsors to donate "an amount equal to 10 percent of the total estimated cost of construction" to offset maintenance costs if they plan to construct the memorial mostly with private funds. The law would add over $10 million to the commission’s private fundraising obligations, more than double what it has raised in five years. "To heck with 'em," Dole said of the memorial’s critics. "We're going to go ahead and build it." 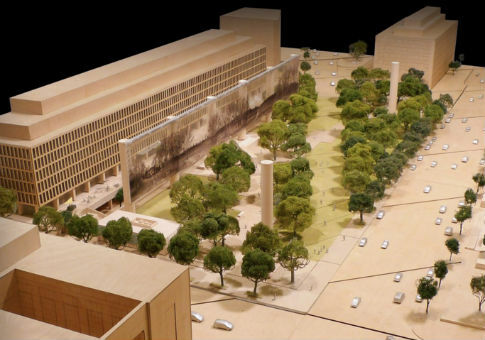 It would take the Eisenhower Memorial Commission 160 years to raise $150 million at its current pace, assuming that the commission has raised the maximum $4.7 million the past five years. Susan Eisenhower, a relative of Dwight Eisenhower who has criticized the Gehry design, declined to comment on the commission’s fundraising effort, but expressed gratitude "to those who have committed themselves to building a lasting memorial to Ike."